NASA, Orbital ATK and United Launch Alliance (ULA) now are targeting launch of Orbital ATK’s seventh commercial resupply services mission to the International Space Station at 9 p.m. EDT Friday, March 24. An option exists to move the launch earlier to March 23, if the Eastern Range becomes available. The additional time allows the ULA team to replace and retest a first stage hydraulic component. Orbital ATK has contracted with ULA for its Atlas V rocket for the launch service, which will lift off from Cape Canaveral Air Force Station in Florida. Orbital ATK’s Cygnus cargo spacecraft is packed with 7,600 pounds of supplies and research for crew aboard the orbiting laboratory. 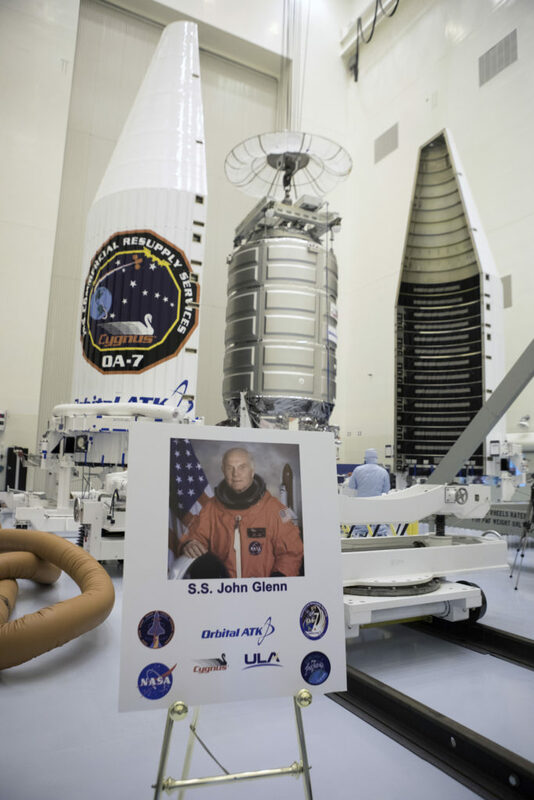 A supply spacecraft set to carry thousands of pounds of experiments and equipment to the International Space Station will also carry the name John Glenn, Orbital ATK said Thursday during a ceremony dedicating the mission to the first American to orbit the Earth. Glenn, who passed away in December at age 95, was one of NASA’s original seven astronauts. After making his landmark orbital mission in February 1962, he served as a U.S. senator from Ohio. After retiring from politics, Glenn made his second spaceflight in 1998 as part of the STS-95 crew flying space shuttle Discovery. 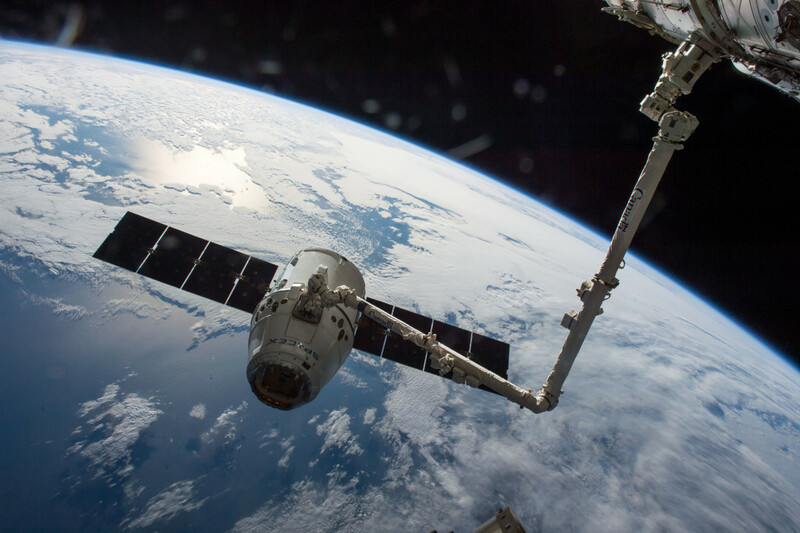 Astronauts Thomas Pesquet of the European Space Agency and Shane Kimbrough of NASA will use the space station’s robotic arm to capture Dragon when it arrives at the station. 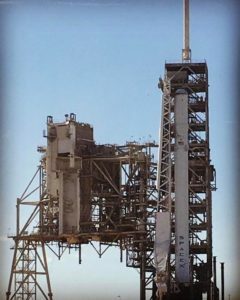 Live coverage of the rendezvous and capture will begin at 4:30 a.m. Wednesday, Feb. 22 on NASA TV and the agency’s website, with installation coverage set to begin at 8:30 a.m.
With one day before launch, the weather forecast for the SpaceX CRS-10 mission continues to improve. Meteorologists with the Air Force’s 45th Weather Squadron now call for a 70 percent chance of acceptable conditions at launch time Saturday morning. The primary concern is for potential violation of the thick cloud layer rule for launch. Liftoff is scheduled for 10:01 a.m. EST from Launch Complex 39A at NASA’s Kennedy Space Center in Florida. 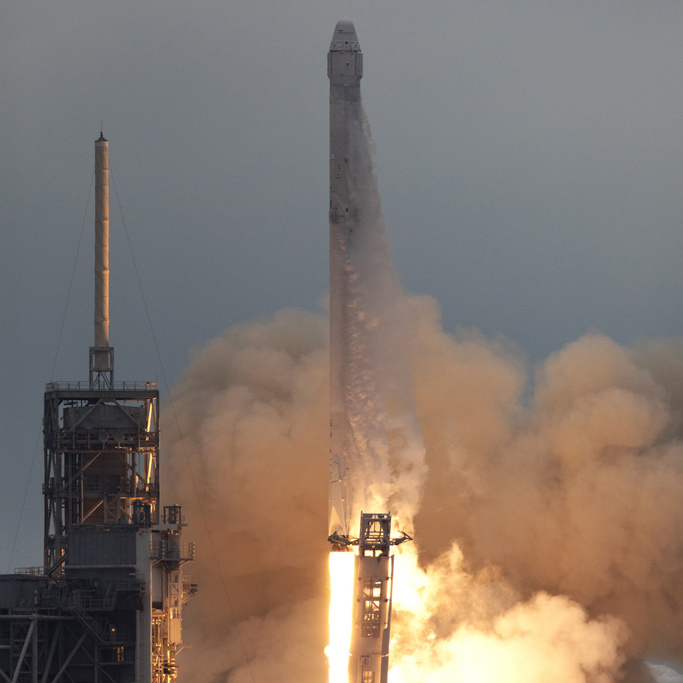 A SpaceX Falcon 9 rocket is to carry an uncrewed Dragon spacecraft into orbit carrying about 5,500 pounds of equipment, experiments and supplies to the International Space Station. For a closer look at the mission itself, read our preview feature at http://go.nasa.gov/2lnx2wb. Here’s the detailed forecast: Cold temperatures this morning will quickly give way to a beautiful, sunny day over the Space Coast. Also today, an upper-level trough generating clouds and precipitation over the central Gulf of Mexico is slowly moving east and strengthening. On Saturday, this upper-level trough will bring moisture over the Florida peninsula. The clouds and isolated rain will steadily progress eastward through the day, although the most significant weather will not make it to the Spaceport until after the launch window. The primary weather concern for launch is the thick cloud cover associated with the upper-level trough. Maximum upper-level winds will be from the southwest at 110 knots at 35,000 feet. On Sunday, the cloudiness and rain associated with the upper-level trough will continue to slowly move east, diminishing through the countdown. The main weather concern will be cumulus clouds associated with lingering instability. Max upper-level winds will be northwesterly at 80 knots near 34,000 feet. The weather forecast for Saturday’s planned launch of a SpaceX Falcon 9 rocket predicts a 50 percent chance of ‘go’ conditions. Liftoff is scheduled for 10:01 a.m. EST from Kennedy Space Center’s Launch Complex 39A, but meteorologists with the U.S. Air Force 45th Weather Squadron cite rain in the flight path and thick cloud layers as weather concerns during the launch window. The rocket is set to carry a SpaceX Dragon cargo module packed with science experiments and crew supplies bound for the International Space Station. This is the company’s tenth contracted cargo resupply flight to the station. 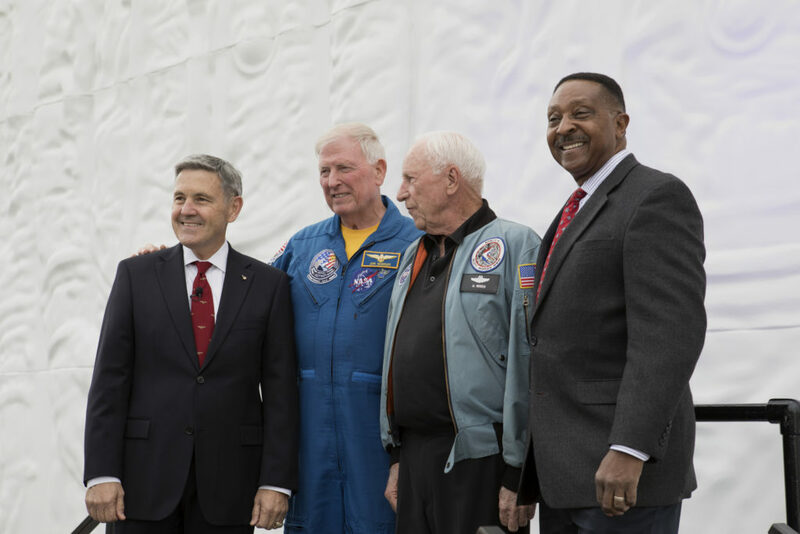 It’s been 50 years since the crew of Apollo 1 perished in a fire at the launch pad, but the lives, accomplishments and heroism of the three astronauts are celebrated in a dynamic, new tribute that is part museum, part memorial and part family scrapbook. 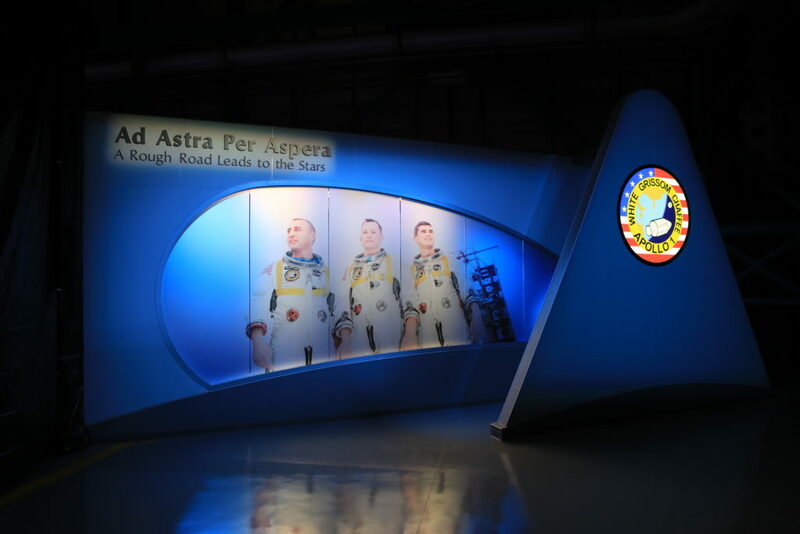 Called “Ad Astra Per Aspera – A Rough Road Leads to the Stars”, the tribute exhibit carries the blessings of the families of astronauts Gus Grissom, Ed White II and Roger Chaffee. It showcases clothing, tools and models that define the men as their parents, wives and children saw them as much as how the nation viewed them. “Although the fire took place across the river on Launch Pad 34, their story didn’t end there and their legacy lives on today,” said Sheryl Chaffee, daughter of Roger Chaffee. 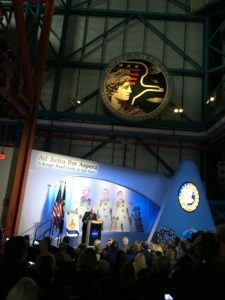 The tribute was dedicated during a ceremony at the Apollo/Saturn V Center at NASA’s Kennedy Space Center in Florida on Friday, Jan. 27, on the 50th anniversary of the fatal fire. It stands only a few miles from the long-abandoned Launch Complex 34, the launch pad where the fire took place. The pad was dismantled in 1968 after the launch of Apollo 7. Members of the Kennedy Space Center community gathered Wednesday afternoon to remember astronaut Gene Cernan with a wreath-laying service at the Kennedy Space Center Visitor Complex. 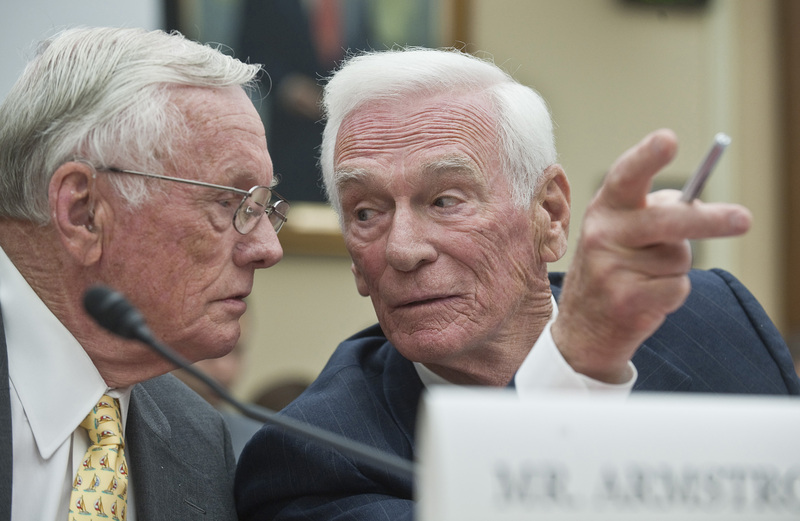 Cernan died Monday in Houston at age 82. Although Cernan made history several times lifting off a few miles away aboard Gemini and Apollo spacecraft, he is best known for commanding Apollo 17, the last mission that saw men walk on the moon’s surface. Cernan, a Navy fighter pilot before joining NASA in 1963, and Harrison “Jack” Schmidt made three moonwalks over the course of about three days as they lived on the moon and drove 22 miles across its face using the lunar rover. 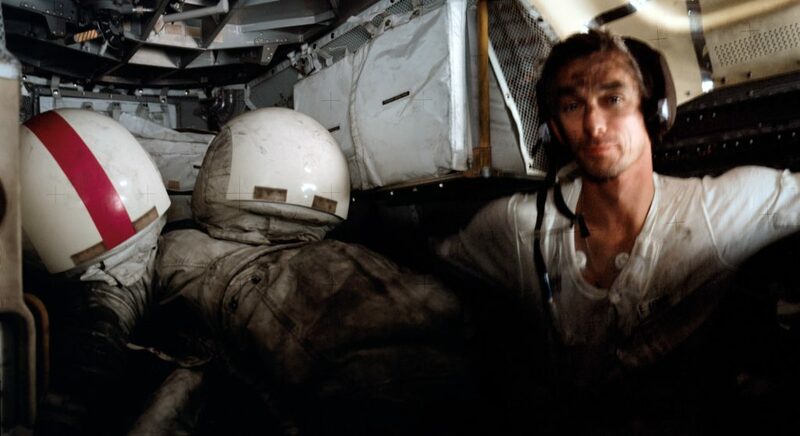 Ron Evans flew the Apollo command module during the mission and remained in lunar orbit while Cernan and Schmidt conducted their surface experiments and collected hundreds of pounds of moon rocks. The astronaut made his first spaceflight in June 1966 as pilot of Gemini 9 with Thomas Stafford commanding. 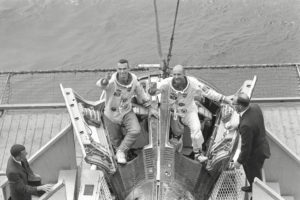 They maneuvered the Gemini spacecraft through rendezvous with an unmanned satellite before Cernan stepped outside the capsule for his first spacewalk. Wednesday’s remembrance ceremony inside the Heroes and Legends hall took place a short walk from the exhibit featuring the Gemini 9 capsule. Cernan’s second mission would take him within a few miles of the moon’s surface as lunar module pilot of Apollo 10. 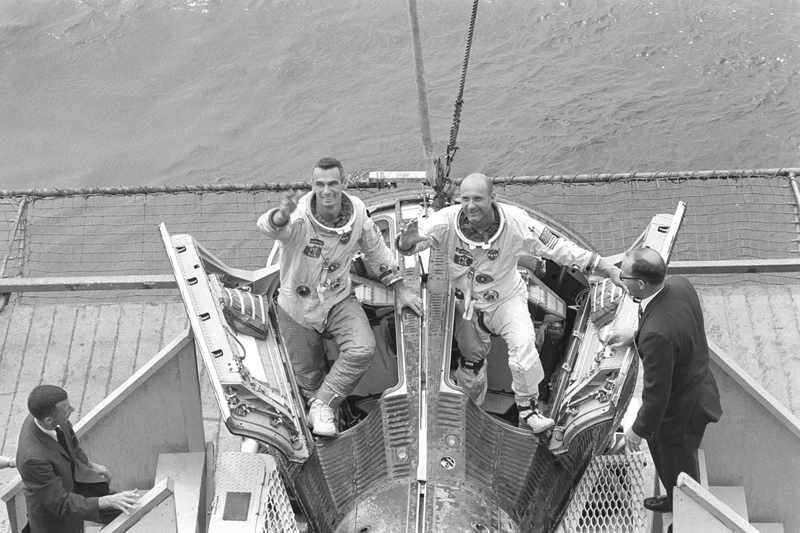 Again with Stafford commanding the mission, Cernan was joined by John Young who flew the command module during the flight that would rehearse all the aspects of Apollo 11 flight, except of course, the touch down. Though he retired from NASA in 1976, Cernan regularly visited Kennedy and was a frequent guest speaker for groups large and small. He was inducted into the U.S. Astronaut Hall of Fame in 1993. Cernan and Stafford spoke to a group of then-new shuttle astronauts in 1978 including Jon McBride. 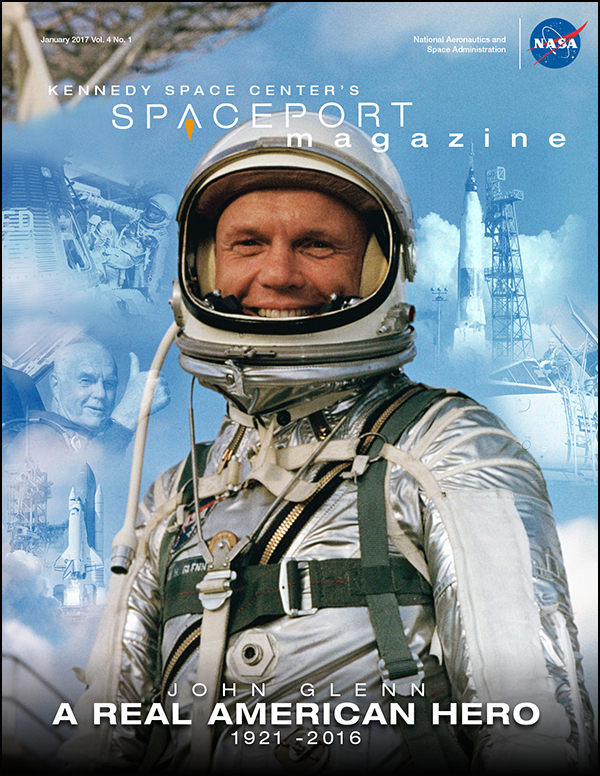 Spaceport Magazine takes a look back at the accomplishments of 2016 and some of the people our space community lost including a special remembrance of American legend John Glenn, the first American to orbit the Earth who later became a senator and returned to orbit on the space shuttle at age 77. From advances made for NASA’s Journey to Mars, to progress toward launching Americans again from Florida with the Commercial Crew Program, this edition highlights the changes that continue to make Kennedy NASA’s premiere spaceport. We also take a look at the missions begun at Kennedy in 2016, including a recap of the December launch of the CYGNSS constellation of microsatellites that will study hurricanes. Click here to download Spaceport Magazine. Many moons ago growing up, actress Taraji P. Henson thought math and science were for boys only. In her role as NASA mathematician Katherine Johnson in the upcoming feature film “Hidden Figures,” she said she dreams and hopes that not one girl will ever feel like she did. 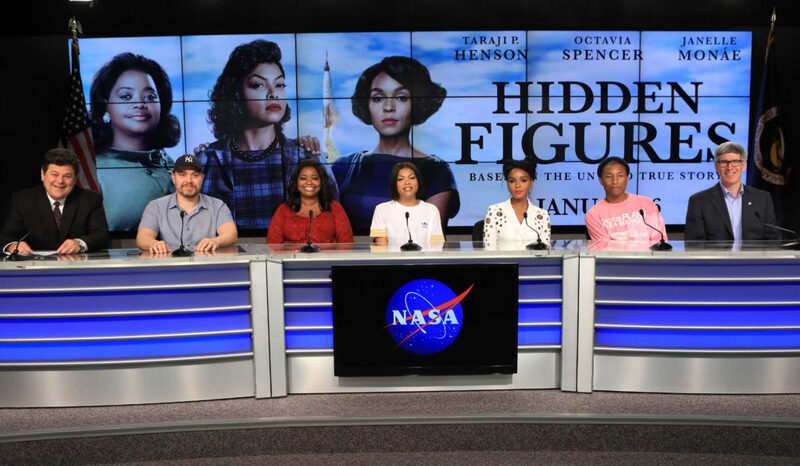 Henson joined writer and director of “Hidden Figures,” Ted Melfi; actresses Octavia Spencer and Janelle Monáe; musician Pharrell Williams; and Bill Barry, NASA’s chief historian at NASA Headquarters, as they met members of the media in a news conference at NASA’s Kennedy Space Center in Florida on Dec. 12. The movie is based on the book of the same title, by Margot Lee Shetterly. It chronicles the lives of Katherine Johnson, Dorothy Vaughan and Mary Jackson, three African-American women who worked for NASA as human “computers.” Their mathematical calculations were crucial to the success of Project Mercury missions, including John Glenn’s orbital flight aboard Friendship 7 in 1962. The movie unveils the struggles of women who were essential to the success of early spaceflight. It also shows how victories for racial and gender rights were not achieved easily or quickly, and that work remains. In the 1960’s, NASA was on an ambitious journey to the moon, and the human computers portrayed in “Hidden Figures” helped get America there. Today, NASA is on an even more ambitious Journey to Mars. NASA is participating under a Space Act Agreement with 20th Century Fox on the film, which is due in theaters in January 2017. Former astronauts, employees and local news media gathered Friday afternoon at the Heroes and Legends exhibit hall at the Kennedy Space Center Visitor Complex to honor the life and legacy of astronaut John Glenn who passed away Thursday at age 95 in his home state of Ohio. A fighter pilot in the Marine Corps, Glenn was one of NASA’s first seven astronauts and gained worldwide acclaim in 1962 by becoming the first American to orbit the Earth. 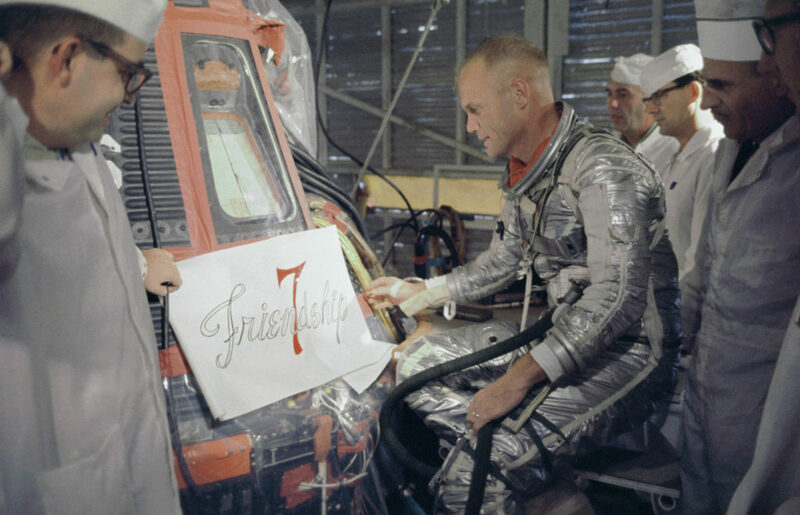 He is seen above before making his Mercury flight he named Friendship 7. After a long career as a U.S. senator, Glenn flew in space again in 1998 as part of the STS-95 crew. Both of his missions launched from Florida’s Space Coast. 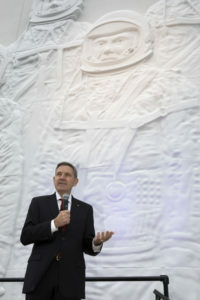 Bob Cabana, director of NASA’s Kennedy Space Center and a former space shuttle commander, spoke to the audience beneath a relief sculpture of the original seven astronauts. Astronauts Alan Shepard, Gus Grissom, Wally Schirra, Scott Carpenter, Gordon Cooper and Deke Slayton, all of whom previously passed, completed the sculpture showing the team as they appeared soon after being announced to the world in 1959. Glenn’s experience, combined with his Midwestern calm and demeanor, inspired many who watched his flight on television at the beginning of the Space Age, including former shuttle astronaut Jon McBride. “As a young man back in West Virginia, I idolized John Glenn and Wally Schirra and all those first seven guys and little did I know I would get to meet them,” McBride told the audience of Kennedy employees and visitors. 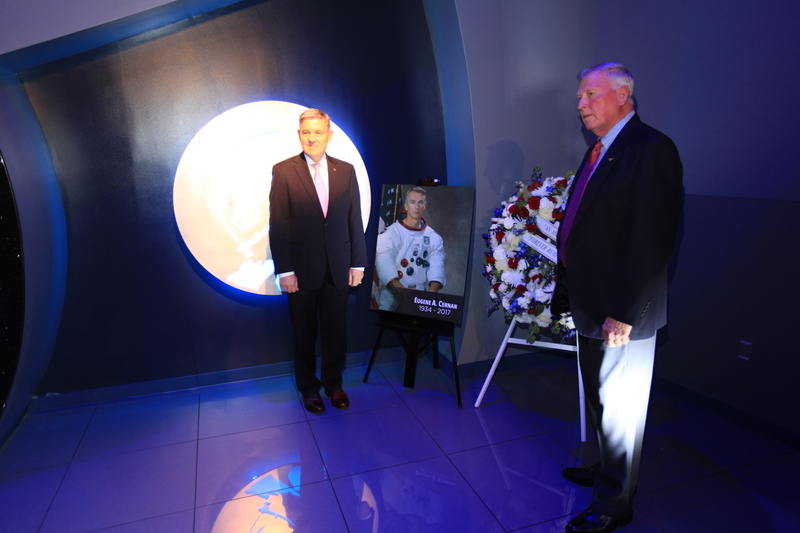 After the ceremony, which included a memorial wreath, the astronauts shared a bit about Glenn’s legacy on today’s NASA.